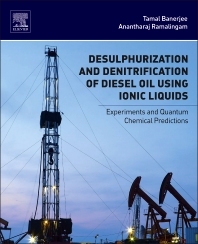 Desulphurization and Denitrification of Diesel Oil using Ionic Liquids: Experiments and Quantum Chemical Predictions discusses how quantum chemical calculations are applied to investigate the fundamental nature of the IL-sulphur-nitrogen systems at atomic and molecular levels. The book will help readers understand the nature of the structural relationship between molecules such as ionic liquid + aromatic sulphur + aromatic nitrogen system(s). In addition, COSMO-RS (Conductor Like Screening Model for Real Solvents) predictions and subsequent experimentation are discussed to evaluate the performance of ionic liquids for desulphurization and denitrification of diesel oil.